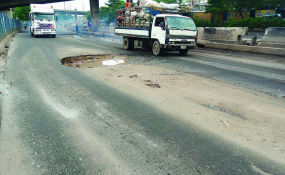 Calabar — RESIDENTS, who could no longer tarry endlessly for the Cross River State Government, have taken it upon themselves to mend potholes and craters on streets of Calabar, the state capital once reputed to have no crack on its paved streets with good drainage system and constant street lighting. But, times have changed as residents pile stones and other rocky objects to cover the potholes and craters derisively called "deep sea port" one of Governor Ben Ayade's signature projects located in Bakassi. A policeman purchased cement to fix hollows at IBB/Okoro Agbor Junction on Margaret Ekpo International Airport route, last week. An elderly man, Ette Okon, also bought a truck of sea sand to fill the bad spot along Palm Street road in Calabar South. In most areas, inhabitants wake up early in the morning to work on dangerous spots on streets and roads near their habitations. "We cannot continue to wait for the government which obviously is not looking in our direction and since we have to drive in and out of our homes we just have to make some contributions to fix the road" Ted, a broadcaster told NDV. He said his street was almost cut off and residents had to cough out some money to buy cement, gravel and employed some youths to work on the bad spots on the road passing through the street. Some residents in the name of rehabilitation, however, dump truckload of waste on the bad spots making the road inaccessible to motorists and even pedestrians, who have a big task navigating through the swamp caused by the garbage. "I cannot understand what the person(s) who did this mean, is garbage now sand or tar that should be used to cover potholes? They have done more harm than good to us, "a property owner on the street, Chief Ikpeme lamented. Along the 8th Miles where the governor plans to build a Spaghetti flyover, some people simply dumped big stones in one the gaping craters, affecting movement on the road. Mr Chris Ita, Chief Press Secretary to Governor Ayade, said his boss has completed arrangements to fill up all the potholes across the roads in the state. "We are waiting for the rains to stop and I can assure you that very soon, before the Christmas, the potholes on roads in major towns and cities in the state would be a thing of the past," he said.